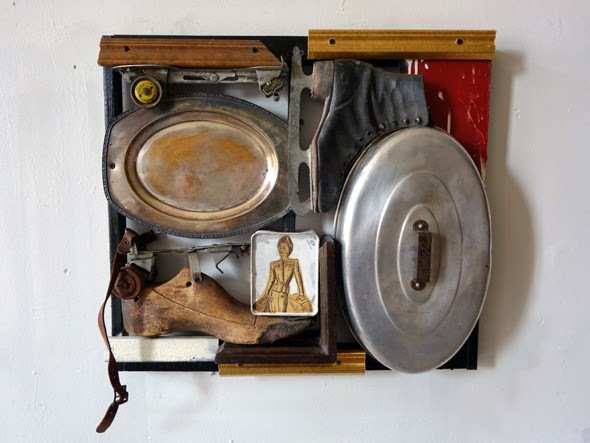 i've been building some new assemblage works over the past couple of weeks. i've finished a few with stencils and some new prints, and have several more that i have yet to approach. there is something i really like in the process of telling a story through elements. there is a great sense of discovery in arranging all the shapes and figuring out how to fit them into a semi-square frame, and i can spend hours sifting through already sifted through junk that i've hoarded in my studio to find the right piece to fit an empty space that will balance out the whole piece. the hard part then becomes trying to find and manipulate a narrative out of the materials with images and language. but like the junk that fills boxes and shelves in my studio, i also have piles of prints and stencils waiting to be pasted or sprayed to create those narratives. i like the idea of creating stories through repetitive imagery. i like that some of my stencils are so over-used that they are nearly a quarter of an inch thick and webbed with solidified strings of paint. some of the more deteriorated pattern stencils look really raw now. here are some of the finished pieces from the past few days. 'nighthawks: after hopper' is my take on Edward Hopper's painting that hangs at the Art Institute in Chicago. i carved a linoblock and printed the bar scene. then i built the rest of the scene out of small canvases, wood panels, frame pieces and the bottom of a tv, trying to capture the angles and the depth in the scene. this painting has always felt so lonesome to me, i must relate to the guy sitting alone at the counter. my addition of the cell phones further isolates everyone, even though the structures are more palpable. 'public auction' is about the forced loss of small businesses and a localized way of life. 'nostalgia' was a challenge to create. i've had these roller skates and ice skates for quite a while. the foot form was my grandmother's; my whole life it was used to hold the bedroom door open at the house in portland. the serving tray was also my grandmother's. but all these odd pieces went together like a whack puzzle of some kind. this piece is pretty small, only about 20" x 20", and has a lot of info stuffed into it. 'robot faces i and ii' are painted over old paintings that i never could sell. they felt disjointed so i free-handed some robot heads over top of the old paintings. i began manipulated the spray paint on the surface more than i usually do. i scraped or wiped it away to reveal the layers underneath and thin out lines. 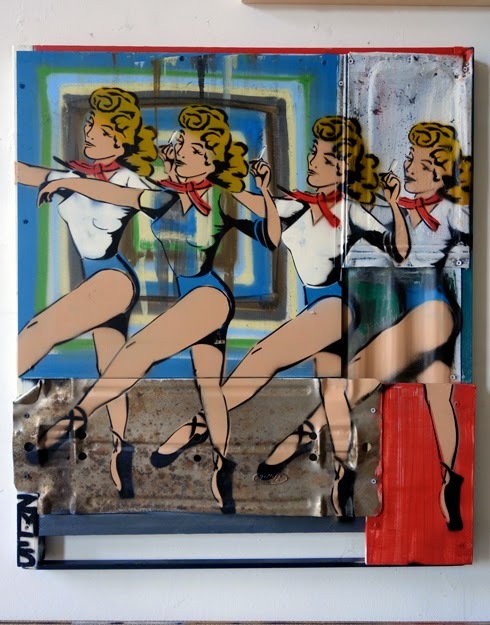 the effect worked to combat the flatness of the spray paint and add more layers to the work. i like how these turned out. they're just fun. and they were fun to paint. 'never stop searching' is a piece i've done several times now. the image stays the same, but the surfaces always change. this is one of my favorite prints from last year. 'chorus line' has one of my often used ad images. the background features a joseph albers/frank stella/revok appropriation (albeit sloppily) of concentric squares of colors leading into a center, each color effecting the others. Your take on nighthawks is great. It's like any given night out with friends...the phones come out and there is that sense of isolation.